This Holiday Caravan is 28 feet long and 12 feet wide. 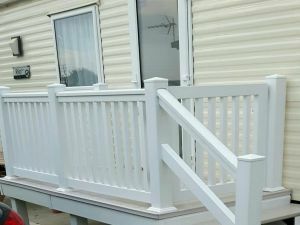 My caravan is a 2 bedroom Willerby Rio premier 2015 model that sleeps 6 people.The double bedroom has a built in wardrobe storage over head,bed side lights. The shower and toilet are in a separate room the shower is a good size and plenty of storage for toiletries. The kitchen is bright and roomy with builtin oven, extractor fan,floor to ceiling fridge freezer a cupboard where boiler is situated. There is a built in microwave large toaster the usual kitchen utensils plates pots and pans. The living /dining area consists of a wall mounted gas fire ,corner table 40 inch TV with built in dvd player,window bay seating with a built in double bed,The caravan has full central heating with radiators in every room,It is double glazed through out. Outside there is room to park along side caravan with a wooden bench and parasol also a outside tap with hose. Please Note Bed linen is not suppled (but pillows and duvets are). There is no smoking in the caravan. ON BOOKING A SMALL DEPOSIT OF £60.00 Is required To hold the date and the balance to be paid 4 weeks before arrival. I will consider small dogs if required. This listing for a privately owned static caravan rental has been viewed 22834 times.